A Straight Transfer - You're Hearing the Master Tape! Now presented in an upgraded, deluxe tip-on gatefold jacket! Cut at Sterling Sound directly from the original master tape. This was a straight transfer, bypassing the console altogether. There was no EQ of any kind. A true direct transfer, using a VMS 80, the most sophisticated lathe. You're hearing the master tape! Cline's life and career has been the subject of numerous books, movies, documentaries, articles and stage plays. She has sold millions of albums through the past 50 years, giving her an iconic fan status, similar to that of country artists such as Johnny Cash and Dolly Parton. In 1992, the U.S. Postal Service honored her, along with Hank Williams, on a U.S. postage stamp. And in 1995 she was honored with a Grammy Lifetime Achievement Award. Cline was also honored with a star on the Hollywood Walk of Fame in 1999. What praises haven't been lauded the immortal singing talent of the late, great Patsy Cline? She died at the height of her career, at age 30, with two other stars of the Grand Ole Opry, and her manager, in a private plane crash near Camden, Tennessee, on the group's return to Nashville from Kansas City. Before that ill-fated flight, though, she left a musical legacy as one of the most influential and successful female vocalists of the 20th Century. In the late 1950s and the '60s, country music was essentially a singles medium. 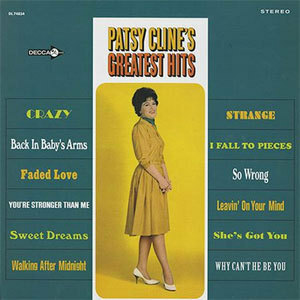 This album, first released in 1967, collects a dozen of Patsy's biggest hits — all of them from the country singles market — including "Walkin' After Midnight," "Sweet Dreams (Of You)," "Crazy," and "I Fall to Pieces." Producer Owen Bradley surrounds Cline's full-throated, emotionally charged vocals with lush, sophisticated arrangements that set the standard for Nashville's "countrypolitan" sound. And trust us, on this 200-gram QRP pressing, mastered by Sterling Sound, Cline's seductive vocals have never sounded clearer or richer. And the packaging on this release is as deluxe as the audio. Analogue Productions has reissued this classic LP in a new deluxe tip-on gatefold jacket. Inside you'll enjoy a spread of vivid color studio publicity shots of Patsy, courtesy of the Universal Music Archives. Before Shania Twain found a new (though not necessarily improved) way to combine country and pop in the 1990s, this was the top-selling country album of all time by a female artist.